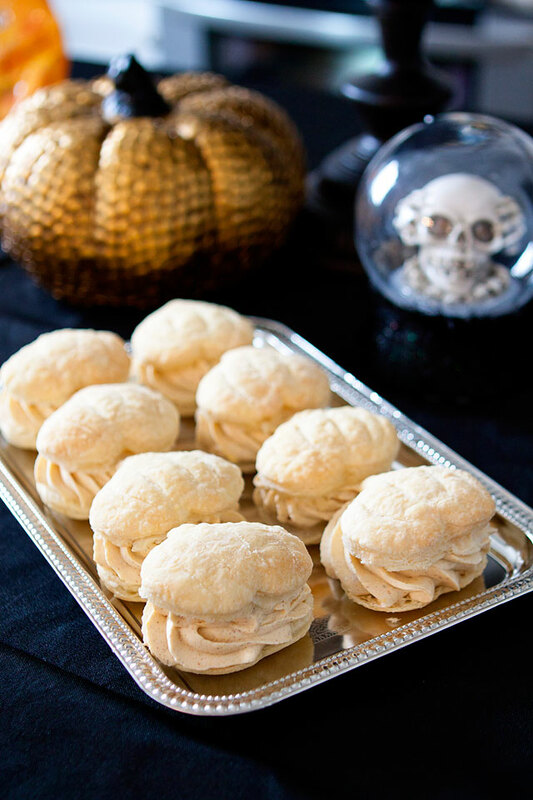 I needed to come up with a fun recipe for a Halloween party, and I decided to make these festive Halloween Pumpkin Cream Puffs! 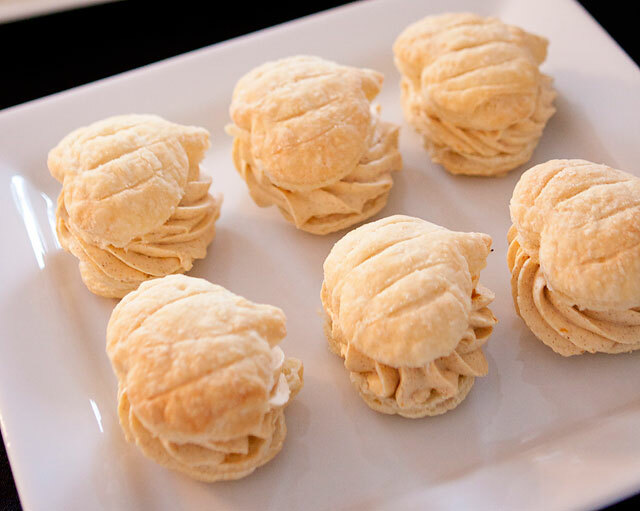 The good thing about these little tasty puffs is that they are simple to make, and do not take a lot of time at all! 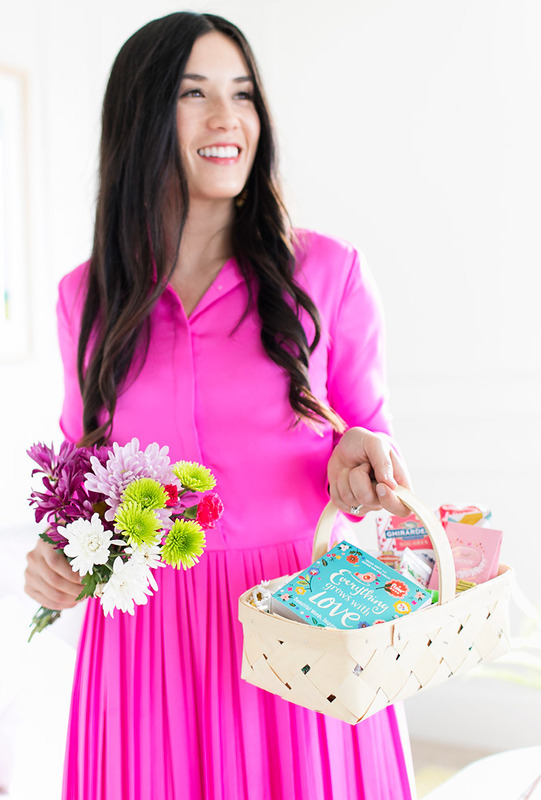 Perfect to throw together for quick treat for a Fall Party! 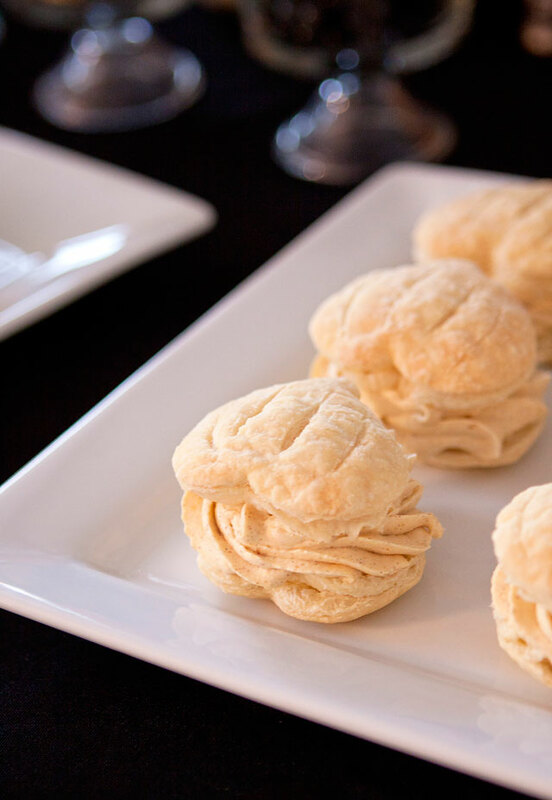 The secret to the simpleness is the store bought Puff Pastry Sheets! You can find them in the grocery store in the frozen isle near the cool whip. 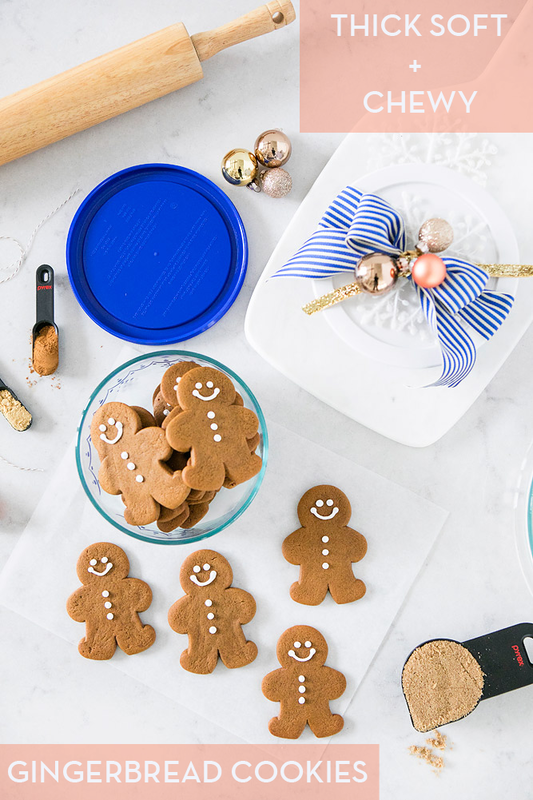 I am always for homemade, but they save so much time, and they can be cut into any shape with a cookie cutter! Sometimes semi-homemade works, and it’s the way to go! 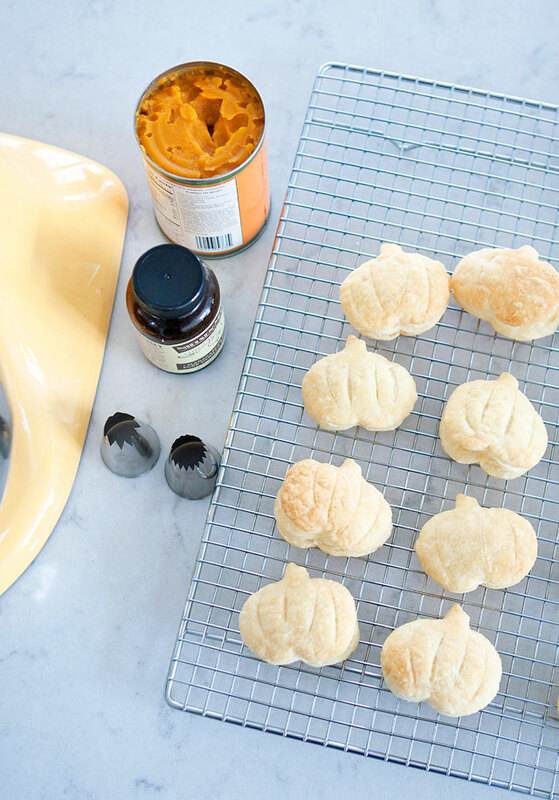 I chose a pumpkin cookie cutter (affiliate links used) shape for a Halloween Girls Night Out! Each sheet made about 9 pumpkins! I cut out two sheets for the amount of filling I made. 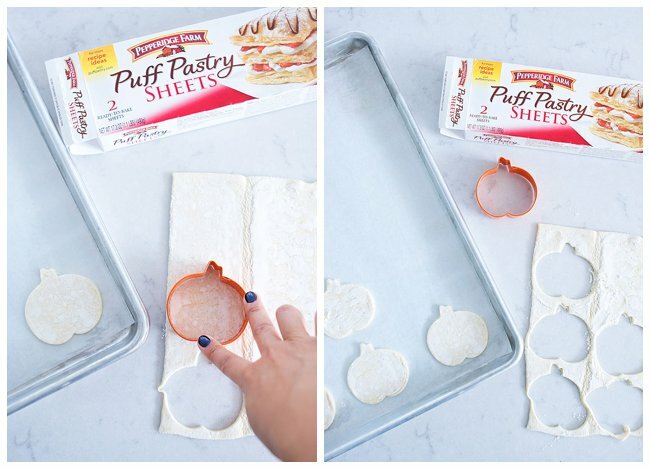 I allowed the pastry sheet for thaw from the freezer for about 40 minutes then unwrap and cut out shapes with a Pumpkin Cookie cutter. After cutting out the shapes onto parchment paper sheets, I took a pairing knife and scored little lines to make it look even more like a pumpkin! I baked them in the oven at 400 degrees for about 13-15 minutes or until they puff up and the tops get to be just barely golden. Cool on a wire rack completely. 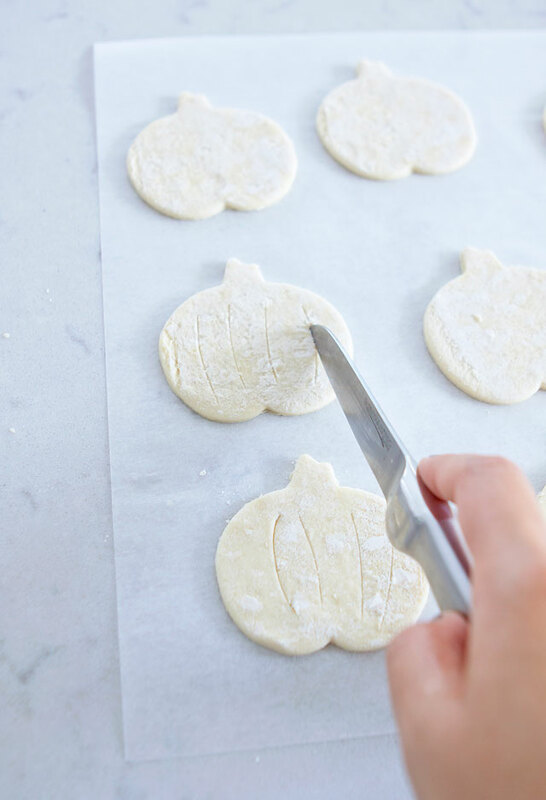 Cut in half like a sandwich ready to fill with Pumpkin Whipped cream filling. Now for the Pumpkin Whipped Cream filling! I wanted the Whipped Cream to be stable enough that it didn’t ooze out everywhere. I decided to add a little Gelatine to help it to stay stabilized. That’s a nice little trick to help whipped cream stay a little more stiff and not fall if you are going to pipe it! And, Vanilla Bean Paste! Always my secret ingredient, and always a must! 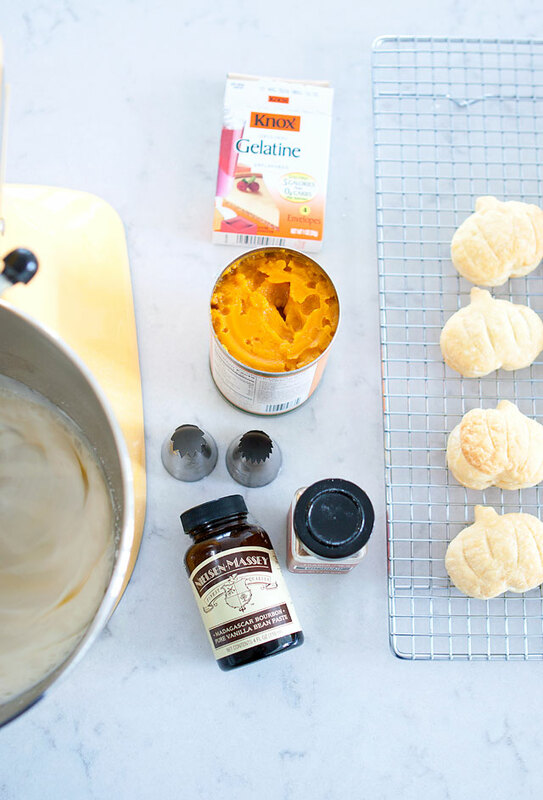 I add a little pumpkin puree, for that subtle pumpkin taste, as well as pumpkin spice mix! Tastes like fall! 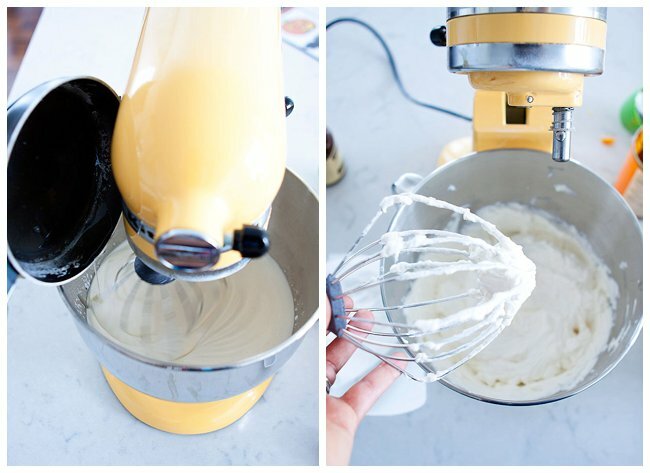 In a mixer, whip 2 cups of whipping cream on medium speed. Add Vanilla Bean Paste, Pumpkin Spice Mix, and Powdered sugar. Drizzle in cooled gelatin mixture. Whip until the whipped cream forms stiff peaks. Place the pumpkin puree in a medium to large bowl. 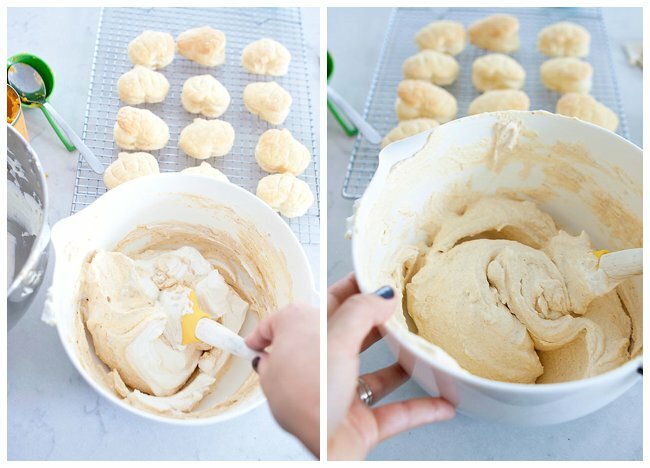 Fold in the whipped cream mixture gently into the pumpkin puree. Folding in 1/3 of the whipped cream at a time. Fold until pumpkin puree is well incorporated. This would also be amazing on pumpkin waffles, crepes, pancakes! Can you imagine! Chill the Whipped cream for at least an hour. 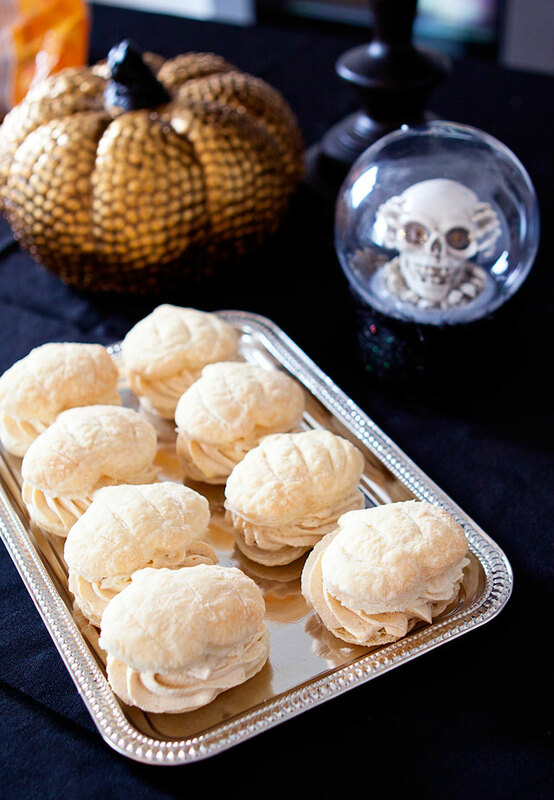 Place in a piping bag, and fill the Pumpkin puffs and serve. 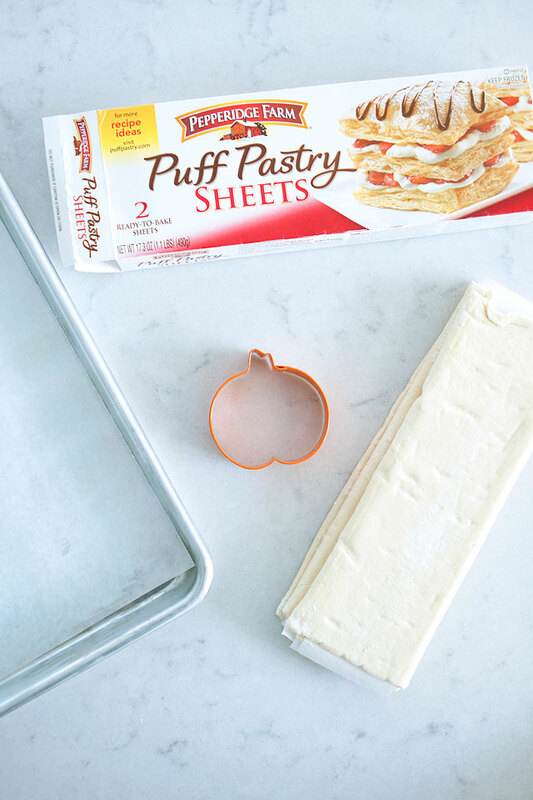 Keep remaining puffs in the fridge. 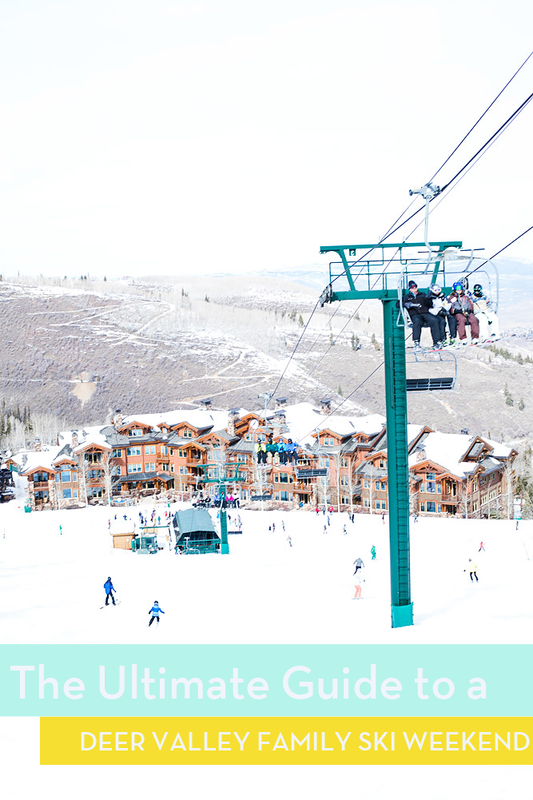 Dust with powdered sugar (optional). 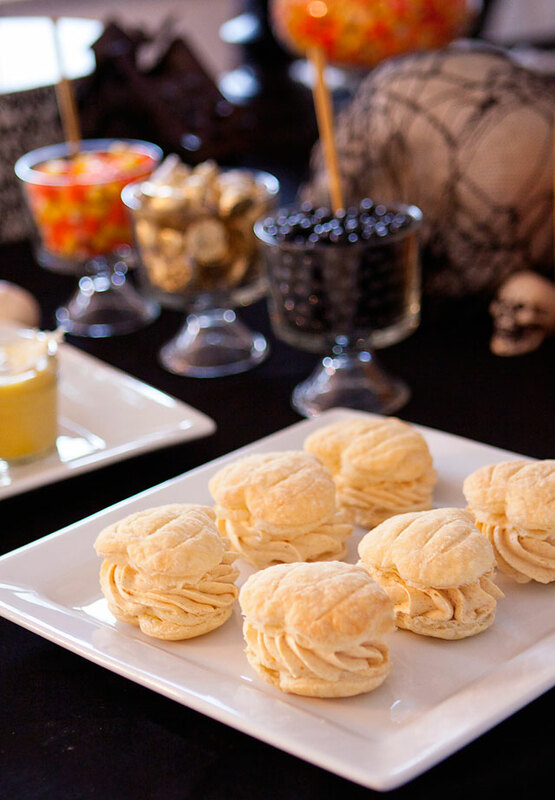 Be sure to check back tomorrow for more on a fun Halloween Girls Night out costume party collaboration where I served these festive treats!